This morning we dove Dhiga Thila. It was a beautiful wall of soft corals, but before we explored the wall, we rested on the bottom and waited for sharks to come in. After a short time with no luck, we ascended to 60 feet or so and followed the reef along our left shoulder. Occasionally the sun shined down on the overhangs offering cool views. The wall was covered in some of the prettiest soft coral I have seen…yellow, orange, blue, red. 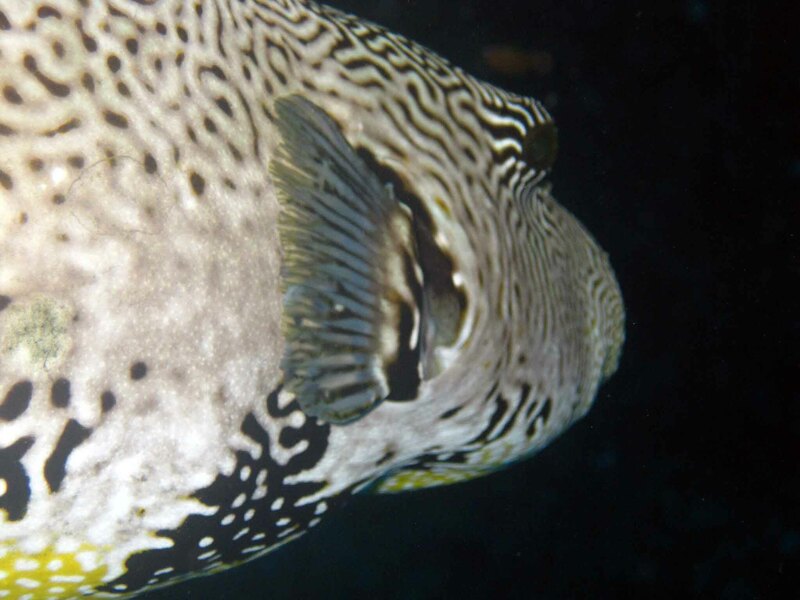 We swam by a few coves filled with fish and then came upon a large puffer that hung around with us a while. Eventually we swam up over the top of the reef and explored at 15 feet. I could have stayed here the whole dive. Lizardfish rested on the magnificent table coral as lovely butterflies darted in between. The nudibranch are becoming a dime a dozen. I’ve never seen so many on one trip. We enjoyed a lovely morning dive. With full bellies from a banana pancakes and egg breakfast, we lounged on the upper deck as the Orion took us a few hours south toward the whale shark area. We went on the hunt for whale sharks but were unsuccessful as we cruised around in the Dhoni by an island with an airport, so we continued south to Sun Island Beyru in South Ari for our next dive. We began the dive swimming seven minutes across channel at 80 feet with the hopes of running into a whale shark. Perhaps it would have been exciting had we found a whale shark, however, I didn’t find myself too enthusiastic about getting my calisthenics in for the day swimming through current with weights on my hips and a BC blown up like a life jacket. Once we made it across the channel to the reef, however, the dive was a different story. We spotted some Christmas tree worms, prevalent in the Caribbean though scarce here in the Maldives. The same goes for coral banded reef shrimp. We saw them on one dive early in our trip and haven’t seen them since. They are a dime a dozen on the other side of the world. On the other hand, many species of fish may be found in both parts of the world, yet the coloration is entirely different. This is one reason why I bother traveling 2.5 days to dive elsewhere! I really enjoy seeing the differences. The reef was home to a variety of marine life such as butterflies, a clown trigger, sweetlips, clams, a crab, a puffer, a titanfish and angelfish. To reach our third dive of the day at Machafushi Wreck, we returned north though despite all the travel we have still remained in the South Ari Atoll for the last two days. I, personally, don’t enjoy wreck dives that much. They are generally in deep water with not much color or marine life, and I don’t have much desire to swim through all the compartments. I considered skipping this dive, but after hearing about the sharks, a eel, a frog fish, mantis shrimp and nudibranch, I decided to give it a go. I should have trusted my first instinct. Rootie and I were ready to surface before we even made it down to 90 feet. Dive groups were dropping in everywhere. There weren’t any sharks and the top deck was chaos. We did manage to see the eel that was hanging upright in the corner next to the wheel house, but otherwise we spent most of our time dodging divers. I saw one nudibranch and one blenny hiding in the open railing of the ship before I had enough and swam to the exterior of the boat with Rootie. We signaled to a few dive buddies in our group that we were going to explore the nearby reef and surface, as we couldn’t even spot our leader in the mass chaos. The reef was home to large amounts of stag horn coral and to Ramona who was doing backflips underwater for entertainment. This was a dive I wouldn’t recommend! Previous Post Manta Rays in the Maldives!